Space Coast Education Center is located in a 10,323 square foot building in West Melbourne, Florida. The facility is convenient to the airport, beaches, malls, and Orlando. 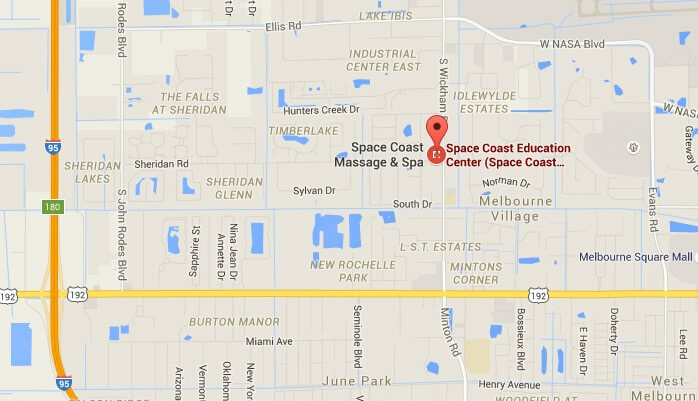 Space Coast Education Center consists of a reception area, retail store, private massage treatment rooms, three spa treatment rooms, business offices, two large lecture rooms and a large practicum area. The classrooms are equipped with demonstration and practice equipment, (i.e. massage tables, massage chairs, skincare and body treatment tables, large screen TV, VCR, overhead projector, slide projector, skeletons and various charts). A library of books, videos, CD’s and cassettes are available to students. A study area is provided for student use. We encourage all prospective applicants to visit our facility and meet our staff.